Mistakes in the investment craft are a given. Warren Buffett makes them; I have made them, and you will certainly make them. The key is to minimize their number and size and to learn from your mistakes by which I mean to make a conscious effort NOT to fall into the trap of repeating an easily avoidable mistake. A very common mistake investors make is to sell AFTER experiencing a precipitous decline in their portfolio. If an investor sells at the bottom, it can do irreversible harm, and for this reason it is critical for investors to understand WHAT they own and WHY they own it. What follows are some real-life examples of what investor mistakes look like. The panicked seller: In December 2008, a colleague recalled a regrettable story about one of his larger clients. This investor, whose portfolio at its peak (in 2007) was valued at around $15 million, became extremely nervous when, by December 2008, its value had declined to nearly $10 million. The portfolio was filled with high-quality blue-chip companies, such as Walmart common stock, that were not only profitable businesses, but ones that would grow their market share if the recession intensified. Nevertheless, the investor was nervous. The advisor pleaded with the client to drive to his neighborhood Walmart and observe the activity in the parking lot. Was the parking lot full of customers walking out of the store after spending a couple of hundred dollars inside? Were there 18-wheeler trucks streaming in and out of the store’s loading dock area? Was it likely that if the recession deepened even more (newly frugal minded) customers show up to shop there? The client was unwilling to go through this exercise because, as his advisor told me, he didn’t think of himself as an owner of the business. In his view the owners were the Walton family even though—based on the number of shares he owned—he received proportionally the same amount of the company profits they did. He thought of his position in Walmart as just another stock in his portfolio that looked like it was tanking. When he told his advisor to liquidate just before Christmas, the advisor gave him this ultimatum. “As a registered advisor, I must comply with your direction to liquidate your portfolio, but I am unwilling to press the button. If you decide to go forward, I will resign from your account and my colleague will execute your wishes. This is the wrong thing to do and I do not and will not take responsibility for creating a permanent loss in your account.” The client understood and the portfolio was liquidated within the hour. The client received a letter from his advisor the day after the liquidation confirming their conversation and recommending that the client refrain from ever investing in common stocks or funds. The advisor feared that once the market rebounded, the client would feel that he “missed out” and would take that $10 million and invest it into a peaking market only to repeat the process. The S&P 500 index closed the year at 865. The index bottomed 2½ months later, hitting an intra-day low of 666 on March 9, 2009. While the client had avoided another brief period of downside volatility, had he remained invested in the portfolio the value would have risen to over $30 million. As it happened, the man was happy to walk away with his check for $10 million. My Advice: No investor should be invested in common stocks without recognizing and acknowledging the declines that earlier investors experienced. Here, I’m speaking principally about the great crash of 1929, the 16-year flat market from 1966 to 1982, the crash of 1987, the Japanese Nikkei crash of 1989, the dot-com burst of 2001–2002, and the financial crisis of 2008. I believe a conversation on this subject between the investor and her advisor is essential in order to either validate that she understands that crashes occur and is willing to accept that risk or trigger a more conservative asset allocation. Regardless of whether investors acknowledge their risk appetite when they open an account, many develop amnesia and fear as the volatility they face appears to be a case of “this time it’s different. The unfortunate panicked investor I just described was likely counseled by his advisor and acknowledged his portfolio risk at the inception of the account, but, when faced with the loss, he simply changed his mind. Had he understood the earnings yield of the businesses (stocks) he owned, he would not have liquidated. On May 19, 2010, I was interviewed along with others by CNBC about the incredible volatility of that day and that year. All of the other commentators explained why they believed the market was going lower. I acknowledged that on that day there was ash in the sky (the Icelandic volcano Eyjafjallajokull eruption that halted flights from Europe), oil in the water (the BP/Deepwater Horizon in the Gulf of Mexico was still gushing oil), and blood in the street (meaning Wall Street). But, I added, if investors simply looked at the net cash earnings of the businesses they owned, they would likely see an earnings yield of 8% or more and that simple arithmetic meant that bonds and cash were not better alternatives. The S&P 500 was at approximately 1080, which was a nice rally off the 666 intra-day level reached in March of 2009. Based on their remarks, I assume my fellow commentators were liquidating their own client portfolios. This was a day that posed a challenge for passive investors, hedge fund investors, and over-diversified investors either because their investment philosophy did not involve studying the underlying investments or because they simply held too many stocks in their portfolios to do this efficiently at such an emotionally charged time. The Derivative Gambler: A few years after the release of Investing Strategies I received a call from the CEO of a local company who had read my book cover to cover. I was thrilled to take the meeting and eager to answer his questions. I was looking forward to his feedback. When we met, he had numerous Post-it notes on specific pages and had highlighted certain passages. At the end of an enjoyable meeting, he complimented the tone I took toward risk management in portfolios and then went on to share his father’s experience. His father was a finance professor at a prestigious European university. Beginning with a portfolio of about $2 million, his father developed a highly successful option trading strategy coming out of the trough of the dot-com bust in October of 2002. Option trading usually includes leverage (borrowed money/margin loans). The portfolio had such exponential success that by 2005, it was valued at over $50 million. By 2007, his portfolio topped $100 million. Along the way, word of the professor’s success got out and a couple of college endowments asked him to invest a portion of their capital in his strategy. As you might guess, to achieve those gains, he was heavily leveraged, and exposed to the financial and housing industries. The sunshine under which his portfolio basked likely faded when the opening salvos of the financial crisis were fired: the collapse of Bear Stearns and Lehman Brothers Holdings. Eventually his trades started to go against him, the margin loans were called, and position after position was force liquidated by his broker. He had placed bullish bets on a sector that was now in free fall and the fact that the accounts were leveraged derivatives sped the pace of the fall. From $100 million, his father was down to $10 million in equity. Still, he refused to exit. A temporary bounce gave him newfound confidence or hope, but soon the portfolio was down to $5 million. Although the portfolio was still double the value that he started with, he refused to hang up his cleats. My Advice: Despite the “great recession,” I still know doctors, business owners, lawyers, and others who dabble in the options market, day trade stocks or commodities, or participate in other high-risk investment behavior. Some lessons are never learned. While there are a handful of skilled investors in the options market, their number pales in comparison to the numbers of ordinary investors who get hooked on the thrill of trading (whether it is options, day trading, or futures). The professor’s first mistake was that with $2 million in the bank he didn’t think he was wealthy. He was more concerned with the next $2 million, then the next $5 million, then the next $25 million. At any point along the way, he could have stopped to take an inventory of what he had built and walked away. There is no crystal ball that will tell a speculator when it’s time to get out. In all probability, the speculator educated himself about past collapses, but he is still surprised that what ignited the collapse in which he finds himself has never before been observed, and thus could not have been predicted. The panicked investor, like our investor in Walmart and the professor, is not the only casualty of markets in freefall. I have witnessed billions of shares of stocks, mutual funds, and even bonds sold the day AFTER bad news comes out. For visual learners, pull up a long-term chart of NYSE trading volume and observe the spike that occurs at market bottoms. Remember also that for every seller on those huge volume days, there is a buyer on the other side of the trade. In recent years I saw the Mexican peso crisis of 1994, the Russian ruble crisis of 1998, the tech bubble of 2000, 9/11, the 2008 financial crisis, the 2011 Standard & Poor’s downgrade of the US credit rating, Brexit, and so on. Throughout each of these periods, markets were dislocated when leveraged investors could not meet margin calls and suffered forced liquidation. Next, hedge funds, index funds, and managed mutual funds receive redemption calls from their investors. A subsequent group of investors, wondering what the first two were thinking and whether another shoe is about to drop, decides to sell. Eventually, good businesses become priced so cheaply that patient capital comes in, provides pricing support, and ultimately prices rebound. It is very important for investors to understand the magnitude of these stories just as it is to show the movie about railroad crossing collisions to new teenage drivers. Author: Niall J. GannonNiall J. Gannon is a Private Wealth Advisor to ultra-high-net-worth investors and lead member of the Gannon Group. He has been recognized as one of the nation’s top 100 Financial Advisors by Barron’s and Registered Rep. 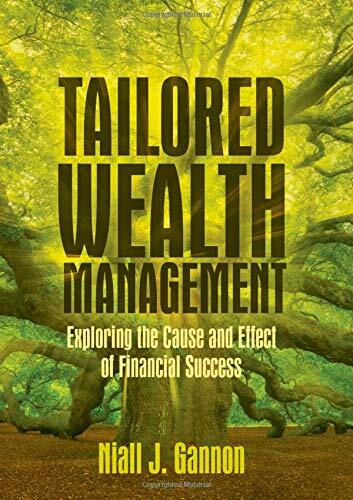 He is the author of Tailored Wealth Management: Exploring the Cause and Effect of Financial Success (Palgrave Macmillan; 2019) and Investing Strategies for the High Net-Worth Investor: Maximize Returns on Taxable Portfolios (McGraw-Hill, 2009). In 2018 he published The Efficient Valuation Hypothesis in Seeking Alpha.